Register for this free, conference style event that will introduce you to hands-on training programs that can lead to a job you love in high-growth career fields. myGPS helps you graduate on time. It's available inside the myEFSC Portal to use yourself or through Academic Advising. Click through for more info & video tutorials. EFSC's Transfer Graduation Pathways for Success are designed to prepare students for eventual transfer to a Florida public university or FCS institution. Click to choose the plan that best meets your needs and learn how to start planning for your future today. Academic Advising, with services located in the Student Center at each campus. Advisors assist you with planning a degree program, understanding your responsibilities as a student and succeeding in your academic career at EFSC. Accessibility Services and accommodations for student with documented disabilities that significantly impact major life functions. 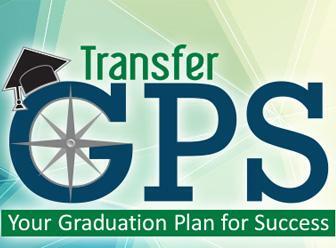 Associate in Arts: Transfer GPS: Graduation Pathway for Success helps you plan your A.A. coursework so it matches up with your bachelor's degree plans. The collegewide Career Planning & Development Center, with a location on each campus. Throughout your college experience, career planning can help you reach your goal of becoming a skilled and marketable employee. EFSC's Core Scholar Program is designed to help students achieve success in the classroom and ultimately in the workplace. Peer Tutoring, Success Coaching, supportive online Learning Communities and Skills Workshops are all part of the free support offered. 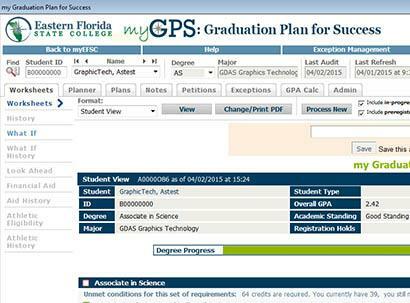 A Degree Audit using the online myGPS: Graduation Plan for Success tool can be run by a student to be sure you're on track for program completion. myGPS can be accessed from inside the myEFSC portal. Developmental Education is based on the insights provided by placement testing and alternate ways to get students ready for college-level course work. 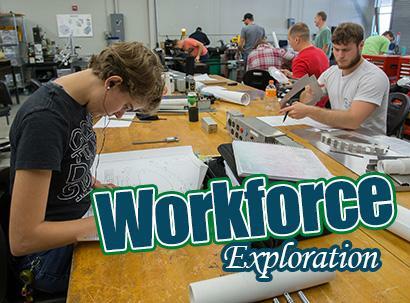 Engineering students should take part in the FITS-STEM Program which includes the potential to earn a $10,000 per year scholarship to Florida Tech. Intensive Language Program, offering courses that address the needs of students whose native language is not English and who need English instruction to pursue their academic or vocational goals. Guaranteed Transfer information helps prepare you for your education plans after Eastern Florida. Learning Labs, offering comprehensive academic assistance and support, including tutoring, to help students succeed. Meta Majors reflect eight major career pathways identified by the State of Florida that group academic programs into clusters with related courses. Advisors offer course planning by meta-major to ensure your coursework at Eastern Florida will transfer into other programs in keeping with your career plans. The Military and Veterans Service Center coordinates resources and educational financial benefits for active military personnel, veterans and their families who are attending Eastern Florida State College. Transfer GPS plans for the most popular bachelor-level majors are available to help you plan your A.A. program so it will transfer seamlessly to another university or college program. TRiO-Student Support Services, providing academic support for first-generation college students (students whose natural or adoptive parents have not completed a bachelor's degree) and students with low taxable income. Tutoring is available for free through the Learning Labs on each campus. Specialized peer tutoring programs are also available as part of EFSC's Core Scholar Program, with free services then delivered through each Learning Lab. Vocational and Career Education Academic Support, helping vocational students meet the Basic Skills Requirements for the Test of Adult Basic Education (TABE). Writing Centers, located on the Cocoa and Melbourne campuses, where students receive assistance with all stages of the writing process.